Public IP addresses are available as a paid feature that is disabled by default. If your account does not have access to public IP addresses, contact your Skytap sales representative. The Manage Public IP Addresses page lists all of the public IP addresses available to your account, as well as the account subdomain assigned to your account for the Skytap-managed DNS service. If you have not generated any public IP addresses, this page displays No Public IP Addresses found. The number of static and dynamic public IP addresses attached to VMs and VPNs. To learn more about these, see What is the difference between static public IP addresses and dynamic public IP addresses with DNS? The number of static public IP addresses that are not attached to any resource. Contact support@skytap.com to request an increase to your account limit. Release a static public IP address. The account subdomain is part of the pattern used to create fully-qualified domain names (FQDNs) for VMs that have dynamic public IPs with DNS attached. For more information, see What is the account subdomain? Use the filter options to see public IP addresses by region, type (static or dynamic), and/or by the type of resource they are attached to (VMs in environments, VMs in templates, or VPNs). Adding a static public IP address creates a public IP address that remains reserved for use by VMs in your account until you manually release it. See Adding a static public IP address to your account below. Use the color indicators to see if a public IP address is deployed (green) or inactive (gray). Click Resources to see the specific resource the VM is attached to. Manage your public IP addresses by detaching or releasing them. See the sections below for more information. Adding a static public IP address from the Manage Public IP Addresses page reserves the public IP address for use by your account. The public IP address remains reserved, until you manually release it. Click Admin > Public IPs. The Manage Public IP Addresses page displays. Click (+ Static Public IP address). The Add a new public IP address dialog displays. Added public IP address [200.200.200.200] in region [region] - The new IP address is added to the list on this page. You have reached the limit of IP addresses available for this account. – You’ve used all of the public IP addresses available for your account. Detach an existing public IP address from another resource. After a public IP address is added, it is Unattached. To attach the public IP address to a VM, see Attaching a static public IP address to a VM. To create a VPN connection with the public IP address, see Creating a VPN connection to your Skytap account. You can detach a static public IP address from a VM in an environment or template. Detaching a public IP address removes it from the resource but keeps it in the collection of static public IP addresses available to your account. Click (Resources) next to a public IP address. A list of all resources attached to the public IP address displays. Click (Detach) next to a resource. The public IP address is detached from that resource. Edit the VPN to use a different static public IP address. Releasing a static public IP address removes it from your account and makes the public IP address available to other Skytap customers. Do not perform this action until you have removed any manually-created associations with this IP address (for example, registrations with private or public DNS services). Releasing a static public IP address cannot be undone. Click (Release) next to the static public IP address. You must also edit the external VPN endpoint to recognize the new static public IP address as the peer IP address. 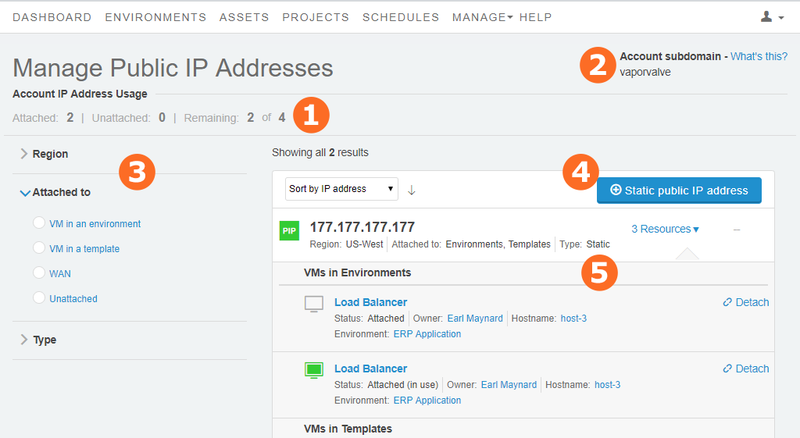 Navigate back to the Managing Public IP Addresses page and click (Release) next to the static public IP address. Dynamic public IP addresses are automatically managed by the Skytap DNS service. When a VM with a dynamic public IP address and Skytap Cloud-managed DNS name is run, Skytap automatically subtracts a public IP address from your Remaining number of public IP addresses. 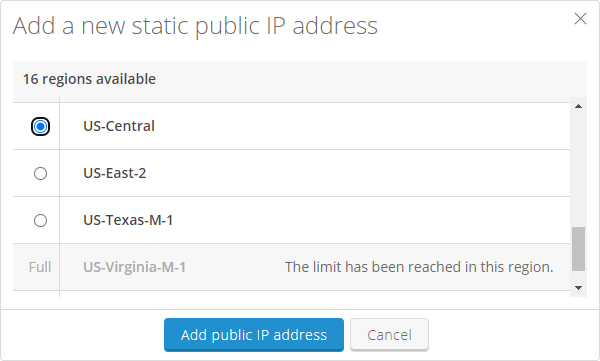 Skytap randomly uses any available dynamic public IP address; these public IP addresses are shared across all customers. For instructions, see Adding a Skytap-managed DNS name and public IP address to a VM. Use the instructions below to detach or release a dynamic public IP address. Dynamic public IP addresses are automatically managed by the Skytap DNS service. When a VM with a dynamic public IP address and Skytap Cloud-managed DNS name is suspended or shut down, Skytap automatically adds a public IP address back to the Remaining number of public IP addresses in your account. Suspend the VM to release the dynamic public IP address, but retain the DNS name. For instructions, see Running and stopping VMs and environments. Edit the VM settings to detach the DNS name and release the dynamic public IP address. For instructions, see Detaching a static public IP address or DNS name from a VM.